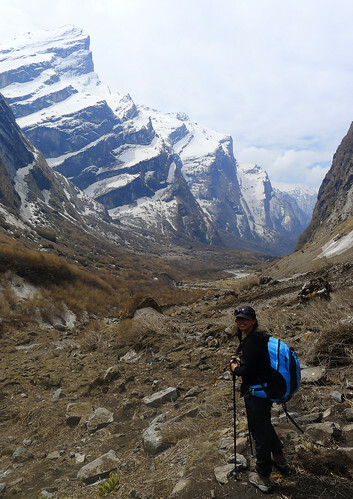 To read all posts on my Annapurna Base Camp trek, click here for the complete series. 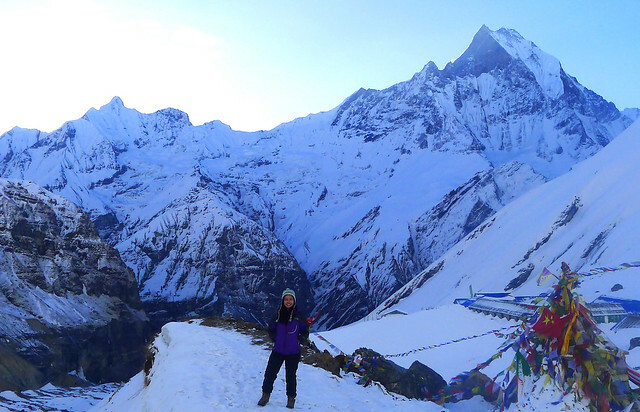 This is how I'll forever remember Annapurna Base Camp. Taken at sunrise on April 23, 2014. I've been postponing this latest blog entry -- mainly due to the horrific avalanche that occurred in the Annapurna Circuit trail just last October 14. This unfortunate event had resulted in the deaths of 43 individuals--a mix of locals and trekkers of various nationalities--and I just couldn't bring myself to start writing my latest Annapurna blog post. 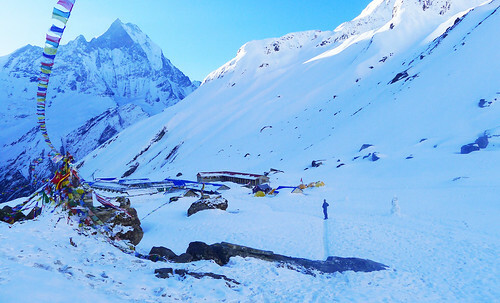 It seemed eerie that I was just talking in my previous post about my fear of encountering an avalanche while on my way up to Annapurna Base Camp...and now this tragedy. This has not been a good year entirely for Nepal's trekking and climbing industry. If you remember, I was in Tadapani on day 3 of this trek when the avalanche up on Mount Everest happened. And this is why I feel so strange right now as I write, because no words of sympathy and support may be appropriate enough to give tribute to the guides, porters, and trekkers who have lost their lives this year on this side of the Himalayas. Nepal is like a second home to me. When you've spent enough time on its mountains, you learn to keep a piece of this wondrous place in your heart. I hope that by writing about my experiences in Everest Base Camp and Annapurna Base Camp (definitely not my last treks in Nepal), I get to honor, in my own small way, the memory of these people who have left this world too soon. I'm normally not an early morning person, but there was no way I was going to miss the dawn breaking over the impressive Annapurna mountain range. It was a wonderfully crisp and cold morning. A few trekkers were already outside, just waiting for the sun to show up. Saw the Thai twins and called out a friendly 'good morning' to them. The snow lay thick on the ground, virtually untouched due to yesterday's heavy snowfall. Since there was only a handful of trekkers who spent the night in base camp, it wasn't a huge crowd, of which I was incredibly thankful for. ABC may be the 'best-seller' route second to Everest Base Camp in Nepal, but it didn't have a commercialized feel to it. The crowd of trekkers was sure to come in an hour or so--composed of people who most likely stayed in Macchapucchre Base Camp or at lower levels the night before. Twin brother and sister from Thailand. 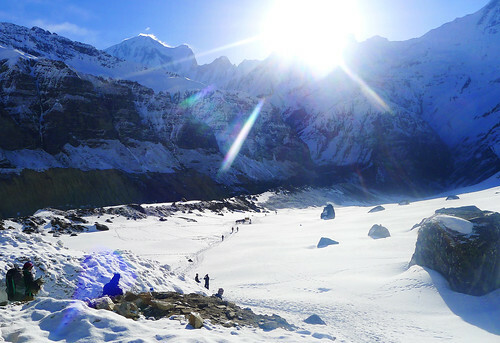 South Annapurna is in front of them, with the sunlight hitting its slopes. As such, Madan, Hari and I practically had the place to ourselves as we stood there, taking photos and waiting for the sunrise. The sun took its time, but oh, what an unforgettable wait it was. I felt so tiny and insignificant, standing in the middle of this circle of mountains, watching as the sky took on different hues of white and blue. Because of Base Camp's unique location, you are actually given a 360-degree view of the sunlight breaking over the mountains. I swivelled slowly from left to right, looking up at South Annapurna, then Hinchuli and then Macchapucchre. The sun arrived in glorious fashion, spilling light everywhere and warming up the place. I took the whole view in, knowing within me that it may take a while before I see this wonderful place again--perhaps never. Travel makes me a more appreciative person as a whole, and I told myself for the nth time how grateful I was to have made it to Annapurna Base Camp and witnessed such a landscape. By the time we finished breakfast at 7:30 am, a whole gaggle of trekkers had already arrived and the place had started filling up and looking like some mini ski resort. The boys and I took a last batch of photo ops by the ABC marker before heading down. I was certainly in a triumphant mood -- having reached ABC as planned, with my altitude sickness completely gone, and being energized enough to face a long day of descent from base camp to Bamboo (2,300 meters / 7,544 feet). Yup! Really and truly made it to 4,130 meters above sea level. Descent was a bit slippery as the snow started to melt in some parts due to the sun. Madan took my hand and guided me firmly down a slippery slope; I was laughing and trying my best not to scream, because I felt that I was going to slip on the ice any minute. Behind me, I could hear muffled squeals from both female and male trekkers as they too negotiated their way down the tricky slopes. 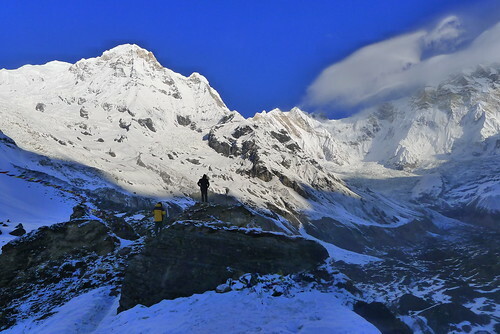 The weather was wonderfully cooperative and the Annapurna area looked stunning from any viewpoint as always. 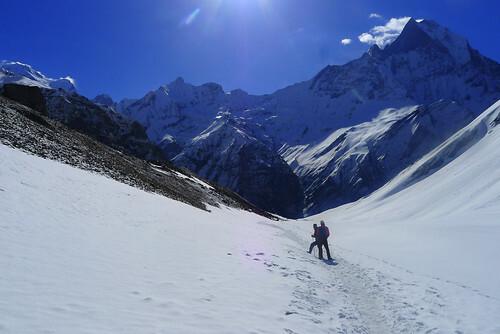 It's really not called the Annapurna Sanctuary for nothing; once you cross the narrow valley and enter this haven, it does feel like you're in a sacred place untouched by time. I called out to Madan and Hari and asked them to stop so I could take this photo. This photo will always remind me how beautiful the Annapurna Sanctuary is. It was an incredibly long day of trekking. Although we were descending, the trail was still rough. Similar to what I did on the way back from Everest Base Camp, I put on headphones and finally listened to some music on the iPhone just to take my mind off the dreariness of the trail. It started raining somewhere between Himalaya and Dovan, past lunchtime. Although that leg would normally take 2 hours, I was determined to cut it down to at least 1.5 hours. Clearly, everyone was tired and not in a good mood due to the rain. But because I've always felt rain was sort of my element (any Filipino would be used to it), I plunged headlong into the forested paths, with Hari and Madan following close behind. Some kind of madness overtook me; I was rushing down quite recklessly, not caring anymore if I would slip. I was bone tired, feeling rather grumpy, and I just wanted this long day to end. Sure, it was raining, but I felt comfortable enough zipping along the muddy path. When we reached Dovan, I turned to Hari and asked, "How many hours did we take?" He smiled and said, "One hour." An hour! Ha! And without saying anything further and without even a water break, we made for Bamboo and reached it after another hour. It was a long and tiring day--not without its hardships, but I was ecstatic to have completed the ABC trek as planned. Day 7. On the way down from ABC. There isn't much to say about the next few days after leaving ABC. After staying in Bamboo for the night, we had to head next for Jhinu (1,780 meters / 5,859 feet), which is famous for its hot springs, but with the required passage through Chhommrong. If you remember my previous post on Chhommrong, this wasn't exactly the most convenient of trekking 'crossroads' because it's situated on a high hilltop. Leaving and arriving here would entail undergoing some pretty rough steps. Felt drained as I had lunch in Chhrommrong and ended up swapping knee injury sob stories with an Indian-Canadian whose knees were in worse shape than mine. From Jhinu, it's a hot and dusty trek back to Nayapul (almost felt like collapsing from dehydration and heat at some point), and then from Nayapul, a short car ride to Pokhara where it all started. The actual trek took a total of nine (9) days only: six days of trekking to reach ABC with Nayapul as the starting point, and three days to get back. 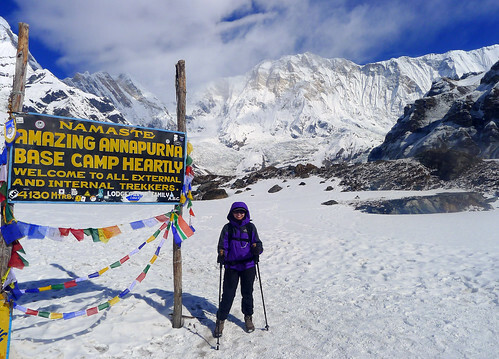 As early as Day 2, I realized that Annapurna Base Camp trek required more physical strength than Everest Base Camp. It was a challenging trail, but it left me hankering for more. Throughout the trek, I knew with certainty that I was bound to return to Nepal for several more times. I had no excuse not to. I had fallen in love with everything Nepal had to offer, and I truly wanted to see more of this country. Fortunately enough, I live in the same continent, and so I could actually afford to go once or twice a year to Nepal if I wanted to; the only challenge was to save up for any trek I set my sights on. Needless to say, I've been planning with Naba and the Himalayan Planet Adventures team on another trek/climb in 2015, and I'm still ironing out the details. Am really hoping to keep you all posted on this soon. In the meantime, I'll be working on another entry or so on costs and logistics when planning your own Annapurna Base Camp trek. I've been getting a couple of messages and emails requesting for such details, and I thought I'd do one for ABC as well, since my entries on EBC trek expenses and 'what to expect' have been getting really good feedback. So thanks, everyone! It's been a great experience so far, and it's really touching to hear from those who said they've enjoyed reading my blog updates. 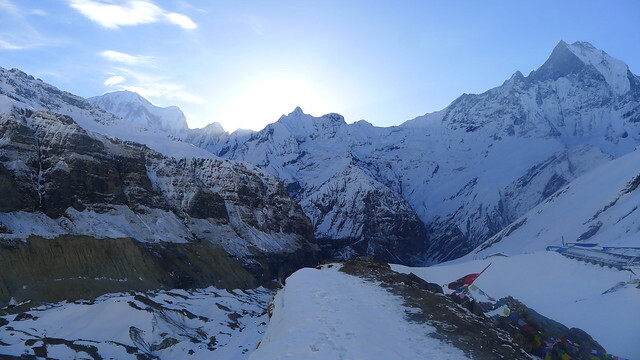 If you want to do an Annapurna Base Camp trek, do consider visiting the Himalayan Planet Adventures website and check out their 16-day Annapurna Base Camp trek package. OT: Pacquiao fans are so excited! Manny Pacquiao will be fighting this 2016.Fortunately we can still see his training and fights at Manny Pacquiao Video Channel . Go check it out! I’m really happy to say it was an interesting post to read. I learned new information from your article, you are doing a great job. Keep it up. As usual great post along with fabulous photos. It sounds interesting to read your blog which provides each an every information. 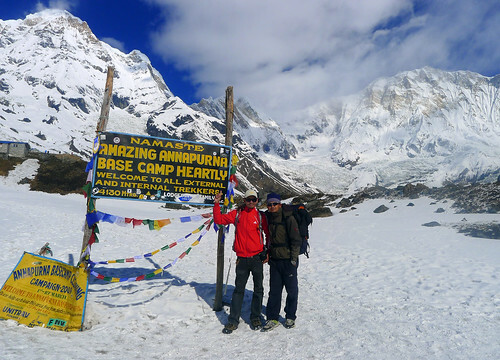 Thanks a lot for sharing your trekking experience in Nepal. Hope to see you soon in Nepal.